Our Worship Area is hexagonal in shape, with seating on upholstered pews. 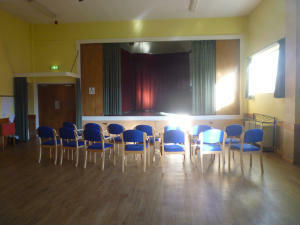 The church can seat around 225 people and is fitted with the Loop system, as well as an audio system and Powerpoint facilities and screen. 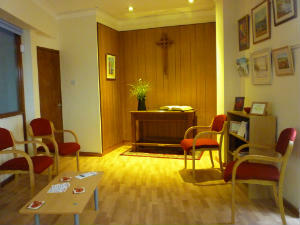 As well as the Main Worship Area, the building has a Side Chapel, now known as The Poppy Room, which is always open and is a quiet space for personal prayer, or small prayer or bible study group meetings. 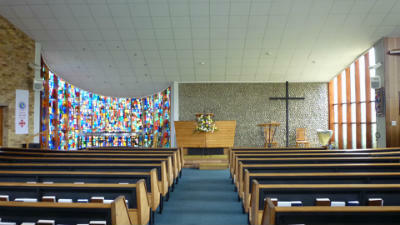 Artwork by church members is displayed on the walls and changes regularly. 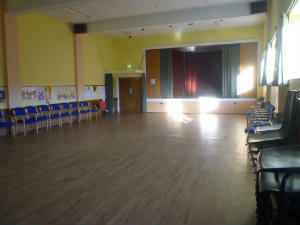 The Small Hall -which has a hatch through to the kitchen is used for Coffee Mornings, meetings, and other smaller group activities. It can seat about 50-60 and has a piano. It is used regularly by our St. Andrew`s Fellowship, the Fellowship Choir and the monthly Wesley Guild, as well as by outside groups who hire the halls. Our well appointed kitchen has a large commercial cooker, dishwasher, fridge, freezer, microwave and a good selection of crockery, cutlery, trays and pots & pans! 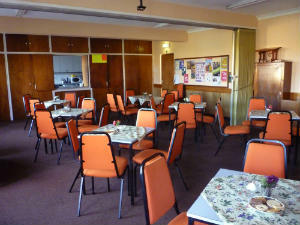 Beyond the kitchen is our smaller room, the Coffee Lounge. 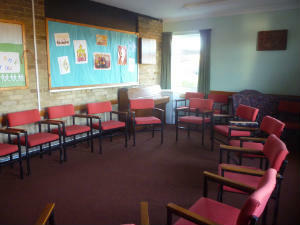 This too is used for meetings, our weekly prayer group, Sonseekers childrens group, and other small group activities. 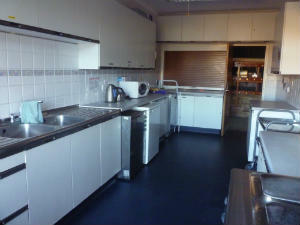 and of course, also has toilet facilities, and an Accessible Toilet, and baby changing facilities.